Come and join us for our annual Xmas Eve 8’s fun competition. Warrington Rowing Club Crews were in action at the weekend, competing in Northwich at the Autumn Head hosted by Northwich Rowing Club. Despite some challenging weather conditions which led to events being cancelled the club had a number of successes. Warrington RC J16 boys won two classes at Nottingham Autumn Head of the River Race on Sunday. Coxes – we need you! 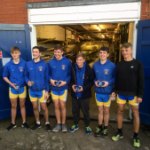 Warrington Rowing Club Crews were in action again at the weekend and came home with 4 wins, competing at the Runcorn Autumn Head – a 4500 metre time trial on the River Weaver. Error: Error validating access token: Session has expired on Friday, 08-Mar-19 04:39:17 PST. The current time is Saturday, 20-Apr-19 15:22:22 PDT.